For talented people around the world, the Green Card is a passport to a new life, an iconic article of identity for anyone aspiring to live and work in the United States. Its impact has been spotted by the European Commission, which this week announced plans to copy it  in blue. The Blue Card  colored to match the European Union's flag  is part of a plan to make it easier for skilled foreign workers get jobs in the 27 member states of the E.U. The combination residence permit and work visa would allow holders and their families to live, work and travel within the Union. If agreed by member state governments, it could be introduced by 2009, alongside a global advertising campaign to draw in qualified migrants. Like the U.S., the E.U. is a magnet for migrants, mainly from Asia and Africa. But the Commission wants to manage the process more efficiently. It hopes the Blue Card will help regulate the flow, targeting bright young migrants who could fill job categories where Europe could face chronic shortages over the next few years. Commission officials say the E.U. has an aging population and a dearth of skilled workers in sectors like engineering, information technology, pharmaceuticals, health care and teaching. The continent desperately needs foreign labor and officials hope some 20 million migrants will arrive over the next two decades. The proposal comes just days after E.U. leaders agreed in Lisbon a new reform treaty designed to modernize the bloc's institutional structure. Commission President José Manuel Barroso said that with the treaty debate behind it, the E.U. could now concentrate on concrete measures to improve life for Europeans. "At the moment, most highly skilled workers go to Canada, the United States and Australia," he said. "Why? Because we have 27 different and conflicting procedures in the E.U." E.U. 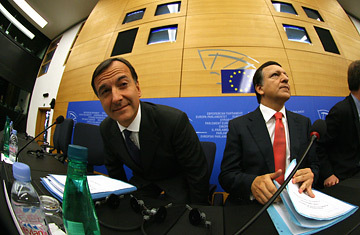 Justice commissioner Franco Frattini, who is behind the proposals, said that 85% of global unskilled labor goes to the E.U. and only 5% to the U.S., whereas 55% of qualified migrants head for the U.S. and only 5% to Europe. Jobs in Europe's high education sectors are growing at 3% per year, compared to 1% in other sectors. However, the percentage of foreign skilled workers in the E.U. 's overall market is just 1.74%, far behind other rich economies like Australia (9.9%), Canada (7.3%), the U.S. (3.2%) and Switzerland (5.3%). Frattini said the Blue Card could help build a channel of targeted, legal migration, making Europe more attractive, and more welcoming, to migrants with sought-after skills. The E.U. Blue Card will use a system similar to the Green Card's points scheme for skills and languages, with some weight given to family ties. For example, computer programmers who speak fluent English and already have family in Europe would be prioritized under the measure. But to be eligible for the card, new immigrants would need to show a recognized diploma, have at least three years' professional experience and the offer of a job that could not be filled by an E.U. citizen. And to actually receive the card, they would probably have to work in a single E.U. member state for at least two years. Once granted, the Blue Card would entitle the hold to the same tax benefits, social assistance and payment of pensions as E.U. nationals when moving to another country. Immigration control remains a prerogative of national rather than E.U. jurisdiction. Public anxieties are likely to prevent Britain, Ireland and Denmark from supporting the Blue Card. They are not expected to be able to block the scheme, but they will be able to opt out of it. However, the Commission believes this is a vital measure if the E.U. is to fill a growing labor shortage over the next decades. "Europe is an immigration continent," Barroso said. "We are attractive to many. But we are not good enough at attracting highly skilled people. Nor are we young or numerous enough to keep the wheels of our societies and economies turning on our own."